Celebrate 20 years of Quilt in a Day with the 20th Anniversary Edition of Eleanor's first book that brought the tradition of quilt making to so many. 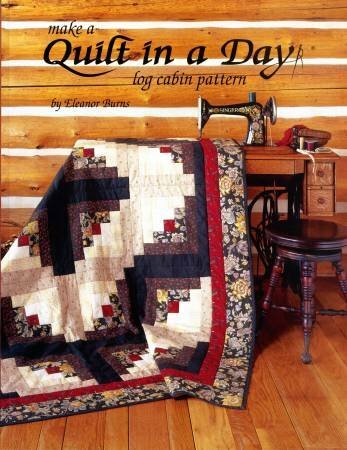 Sewers of all ages can make a Log Cabin quilt in 10 to 16 hours with this book's easy step-by-step directions and clear illustrations. Yardage charts, color combinations, and a choice of pattern settings are given for a variety of sizes. This anniversary edition features color illustrations and photos throughout, as well as six new pages of layouts, new finishing techniques, and of course, new quilts!Layouts include: Dark with light, Navajo, Mountains, Fields and Furrows, Peaks and Valleys, Stained Glass, Arrow, Windmill, Cross Hatch, All Sevens, Postitive/Negative, Four Square, Light with Dark, Zig Zag, Whirligig, Barn Raising, Sundburst and Starlight!